I’ve been both charmed and embarrassed by the accolades I received after my last post about running the Toronto Women’s 5k race at 30 weeks pregnant. Thank you very much, readers! 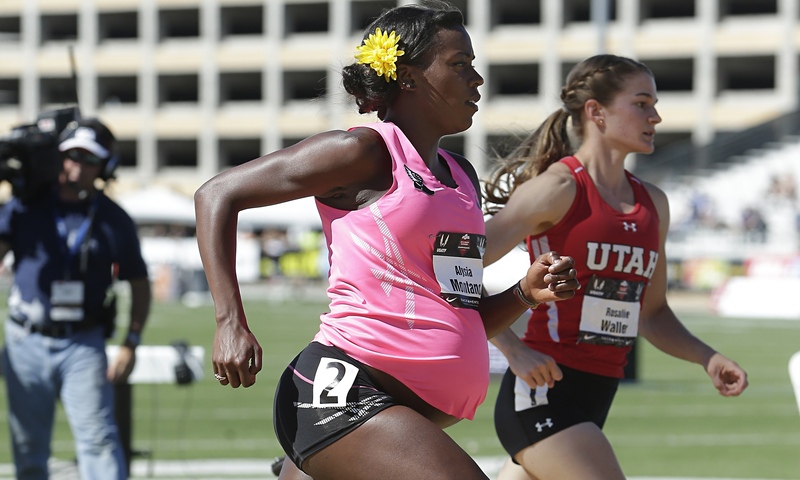 Just to put it into perspective, just remember that Alysia Montaño was still racing track events at 8 months (34 weeks) pregnant…. Or how about my friend Lara? She is 10 weeks ahead of me, which put her at 40 weeks (that’s full term, folks) when she proposed we go do a spin class together the day after the race. On her due date. I suggested a nice long walk instead, but no, she was insistent: spin or bust. So yes, on her due date, we could be found at Quad spin studio spinning our legs furiously and being shouted at by a bearded man in spandex. I was tired from the race the day before and was sweating profusely… Lara elegantly maintained her pregnant glow and kept up with the furious pumping while I gave up and sat out a couple rounds, pretending to churn my wheels while secretly setting the bike to the easiest setting possible. Two days later, a now overdue Lara was suggesting an outdoor prenatal yoga session. We found a yoga video online and proceeded mostly to ignore it, instead having too much fun clowning around in the soft sunshine. Lara is now 41 weeks and 1 day and I am wishing her all the best…. as she continues to walk, jump and skip to get that baby out! Good luck Lara! Maybe one last spin class will do it? I’ve been touched by the outpouring of congratulations and support after my Pregnant Pause post last week. I was in Canada for a short visit with my parents / escape from Florida heat and unsurprisingly I discovered that I could run much better in the cooler temperatures. I enjoyed a couple of cooler runs (16-19° C/ 61-66° F) at the cottage, including a mighty 9 km (5.6 miles) which is the longest run I’ve managed to do since I think about 21 weeks of pregnancy. I felt good! I felt great! So what to do but enter a race over the weekend? Of course! Tom and I ran the Toronto Women’s Half Marathon in 2013 when visiting Toronto for our friends’ wedding. It was conveniently the same weekend that we were in town and it takes place every year in Sunnybrook Park, which is very near to where my parents live. So I was pleased to discover that I happened to be in Toronto yet again for the event. Now, don’t think I’m so foolish or crazy to try to jump to a half marathon at 30 weeks’ pregnant after doing one 9km run… no, but they offer a 5K too! Forget the ideal running temperatures of the previous mornings. By the weekend, it was hitting highs of 32°C/90°F. I was lucky enough to be coming from a hot place with plenty of heat acclimatisation, but all the runners here were training over a cold winter and it actually snowed just two weeks ago. From snow to sweltering! My father had kindly accompanied me to the race, and we had nearly a mile hike on steep trails from the car park to the start of the race. My heart rate was already far too high. When we got to the start, I jogged a 1 km warm up and my heart rate was hitting 180 (that’s nearly exploding, if numbers are less meaningful to you). I thought, well, it was a nice try, but today is not going to be my day. Oh well, let’s jog it and see…. Meanwhile the half marathon was shortened to a 12km race in an effort to prevent people from fainting on course. Always a good sign! I started at the very back of the first corral. Pregnant running is very strange… you just can’t have any expectations. Some days I don’t make it to 500m before I have to walk. Other days, I feel great. What would it be today? Especially in the unexpected heat? I won’t bore you with a blow by blow of a slow 5K, but I surprised myself, staying even paced and slowly overtaking the overly keen runners in front of me. I had to take two short walk breaks to get my heart rate down from the heavens (190s), especially after a couple of the little hills, and I grabbed the proffered water that I would normally fly by on a regular day. I did ignore the chocolate station…yes, they have a chocolate station, all melting oozy in the heat, I am sure. I had lots of support on course from other runners, including the winning lady as she streaked by me after the turnaround point. And lots of looks of outright surprised looks! And there it was, the finishing arch! I had made it through, and in a better time than I had expected, given the heat (uh and the bump), 26:59. I was aiming for under 30 min and felt like I’d given it the best shot that I could. I was surprised and pleased to find out that I actually finished 7th in my age group out of 111 people, and 62nd overall out of 772 runners. My poor father looked slightly worried as I collapsed onto the grass after the race, catching my breath. “Are you feeling okay?” he asked. I had to explain that this was my typical posture after any 5K race and had nothing to do with pregnancy! I hope to keep running for as long as I can, IF I can. And now that I’ve resigned myself not to care about finishing times, well, I might just keep an eye out for another 5K race in the next few weeks….. This study showed that female mice who exercised during pregnancy were more likely to have offspring who actively sought out exercise. Where exercise-loving mice were prevented from carrying out exercise during pregnancy, their offspring did not show a love for exercise. A number of elite athletes have continued to train throughout pregnancy with amazing results, including most recently: Stephanie Bruce (who ran an Olympic standard 10K just 6 months post-partum, yes, that’s a 32 minute 10K – read her blog about it here); Julia Webb; and Alysia Montaño (made famous in non-running circles for this EPIC photo of her racing 800m on the track at 8 months pregnant). And of course the fact that Jo Pavey won the gold medal at the European Games for the 10K at 40 years old 10 months after giving birth. There is some evidence that women can become even faster and stronger after giving birth. For example, Paula Radcliffe‘s unbeaten world record for the women’s marathon (still standing since 2003!) of 2:15:25 was set 3 years after the birth of her second child, or again Jo Pavey as above. Of course lots of women would like to be active during their pregnancies, but can’t, due to various complications or even just plain and simple pain and discomfort. I’ve had to dip in and out of it myself due to the latter so I certainly sympathise with those who are experiencing more limited options. I consider every run I do now to be savoured and appreciated, as I never know which run might be my last! This morning’s 6km jog was a complete disaster!